The Parsey Event Complete A Campaign Goal can be extemely useful by placing brand new contacts immediately into an Infusionsoft Campaign for instant followup, nurturing, email broadcasts, etc. Inside Infusionsoft, go to the campaign that you would like your contacts to enter immediately. Drag the Other campaign goal onto the canvas and name it whatever you want. Double click the tag icon to select the rules for the goal. 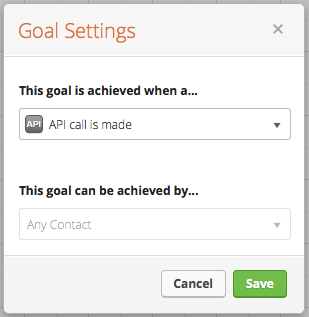 From the drop down, select API call is made and hit Save. Double click the goal to bring up this window. You will need to create a Call Name, this is for your reference only so it can be whatever you want. Then hit Save. 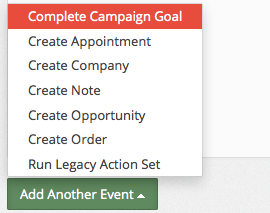 Inside your Parsey Action, select Complete Campaign Goal from the Add Another Event dropdown menu. 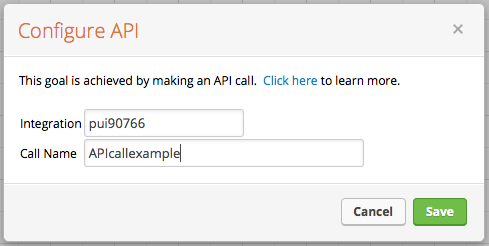 Place your Integration Name (app name) into the first field, and your Call Name into the second field. Then click Save Campaign Goal. You're done!